Stories from mothers with gestational diabetes are like snowflakes! Each one is so unique, providing us with invaluable insights, inspiration and some good laughs. This interview is with Pip, a mother and foodie (amongst other things). She currently lives with her growing family in Portland, Oregon in the U.S.
GDRecipes: Pip you’re originally from Australia and moved to Portland, Oregon in the U.S. in 2007 and you’ve recently given birth to twins (congratulations!) Which have you found harder to adjust to – life in the U.S. or the 2 new additions to the family? Pip: The twins have been a surprisingly easy adjustment. Once I got over the shock that I was unexpectedly having twins (actually, I’m not sure I really am completely over that shock), they have been far easier than I anticipated. Even the twin pregnancy was easier, for some strange reason, which is not usually the case. Moving away from Australia was very hard, and it is difficult to be so far away. My three year old daughter is definitely an American, she calls me ‘Mommy’ despite my best efforts to be Mummy or Mama. Also getting back to Australia with a family of 5 is now a significantly more expensive endeavour! It is really difficult to think about my kids not getting to experience a proper Australian childhood. On the flip side, I think I am pretty assimilated to the US now, and I do love it here. GDRecipes: You had GDM in your first pregnancy in 2008 as well as with the twins. Can you describe what that first diagnosis was like? Pip: The first diagnosis was very upsetting. I didn’t think I would have GD, it never even occurred to me, since I am a pretty healthy person. It was just another test I was confident I would pass. I was shocked when they called me about the diagnosis. I remember lying in bed and crying and feeling like I had somehow failed at pregnancy. I looked online at all the possible complications for the baby and felt really frightened. And initially I hated doing the finger prick tests, I would hold the needle next to my finger and get more and more anxious about pressing the button to draw the blood. I did have a friend who had it, worse than me, and she could barely eat any carbs at all. So pretty soon I realized I could eat a fairly normal diet, which was a relief. I tracked my blood sugar numbers pretty carefully and got good feedback from my doctor and nutritionist so that made me feel better, and less worried about possible complications for my daughter. So all in all, it was a bit of an emotional rollercoaster that first time around- the second time was no big deal- I expected to have it and I did! GDRecipes: You didn’t require insulin with either pregnancies and managed your GDM with diet and exercise. In your first pregnancy, how strict were you? Pip: Both times my blood sugar numbers were pretty good- I could eat a moderate amount of carbs without too much trouble. I cut out most sweet food but I could still eat bananas, dark chocolate and fruit yoghurt, which was nice. So it made it easier to get some nice treats in moderation. And I used to walk pretty regularly even though I was really, really slow. The hardest part I found was the unpredictability of my blood sugar numbers, I could eat exactly the same meal and have widely different blood sugars afterwards, which was frustrating. GDRecipes: But you were told you had to limit exercise during your twin pregnancy. How did this change things? Pip: I didn’t exercise much during the twin pregnancy since I had to be careful to avoid pre-term labour, but on occasion early on if I ate something I shouldn’t, I then would walk around to walk it off and that seemed to work pretty well. Especially with the twin pregnancy, I had to make sure I was getting enough calories also – so that was always a juggle. (The boys were 7lbs 7 oz (3.3kg) and 6lbs 8oz (2.95kg), so I figure I did ok!) I just had to be careful to spread out my carb intake so I was taking in carbs in a slow, steady amount and that seemed to work. GDRecipes: Can you share any recipes or food that helped get you through? Pip: Dark chocolate doesn’t have as many carbs as you might think- so a few squares can satisfy a sweet craving. In cooking I switched out potatoes for sweet potatoes and that made a big difference. I found that I couldn’t eat cold cereal without having high blood sugar afterwards, but that hot porridge was completely fine – go figure, but I’ve read that that’s not uncommon. I ate a lot of lentil soup. I ate almonds with fruit to add in some fat and protein to carbs. GDRecipes: How did you feel when you fell pregnant the second time? Were you anxious you’d develop GDM again? Pip: I was happy to be pregnant again, completely shocked to be pregnant with twins, and was more or less expecting the GDM diagnosis- especially once I knew about the two babies. I knew that probably increased the chances of a second GDM diagnosis, and I wasn’t too worried about it since it was a known quantity second time around. The diet felt pretty familiar and that was comforting in some respects! I was a bit anxious about having to do insulin shots, but I was glad that turned out not to happen. GDRecipes: How has GDM impacted your diet now? Are you concerned about the high risk of developing type 2 diabetes and are you doing anything to keep that in check? Pip: Right now I am exclusively nursing the twins, so my diet is pretty heavy on the carbs and I am allowing myself ice-cream. Usually I have more of a salt tooth than sweet, so I worry more about cholesterol and heart disease, but I am aware that I had better watch my diet to not develop Type 2 in the future. But – mañana, mañana! GDRecipes: In what ways has GDM changed the way you prepare meals for your kids? Pip: It hasn’t really. I make sure to give my daughter a carb, a protein, a couple of vegies and at least one fruit at every meal plus milk or water. She gets a few M&M’s from Grandpa every Sunday and the occasional chocolate milk for special occasions, but we try hard not to have her eat too much sugar. She has a pretty wide enjoyment of food, for example she loves sushi, seaweed and tofu, but I think that is more luck than good management! GDRecipes: I’ve heard Portland is a mecca for great food. Is that something that interests you and your husband? Pip: Portland is a veritable cornucopia of great food options and we are lucky to live in an area that has many fantastic restaurants, cafes and food carts (a Portland speciality). We are rather food focussed so we keep an eye on what’s going on in the foodie scene and try to shop at Farmers’ markets when we can. I also try to eat seasonally, so we’ve been enjoying asparagus recently and the local berries are just hitting the markets. I still miss Australian breakfasts though- they are the best. GDRecipes: So you told me there was no history of diabetes in your family – what about twins? Pip: No history of twins in the family- it was a total surprise! Apparently the chance of having fraternal twins rises as you grow older and the ripe old age of 36 was apparently old enough for me! They are very sweet boys though and I am excited to watch them grow up. 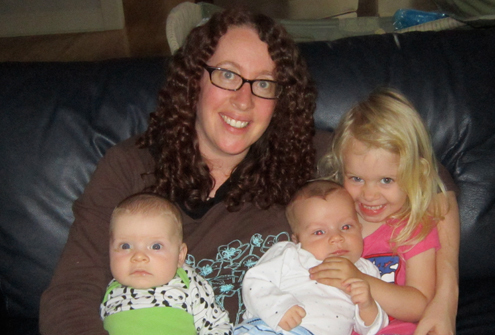 GDRecipes: What is life like now with twins and a toddler? Any tips? Pip: We have an au pair living with us, which makes life a million times easier. We do lots of baby wearing, which is key to getting other things done. And we’ve probably let our toddler watch more episodes of Dora than we would like. But hey, with three kids, whatever gets you through the day, I reckon. I really enjoyed this story, and found myself nodding away – always a mirror of my own experiences. It’s so reassuring to hear others feel the same way both pre & post baby and I know these recipes will make it easier for me to manage my hectic lifestyle.